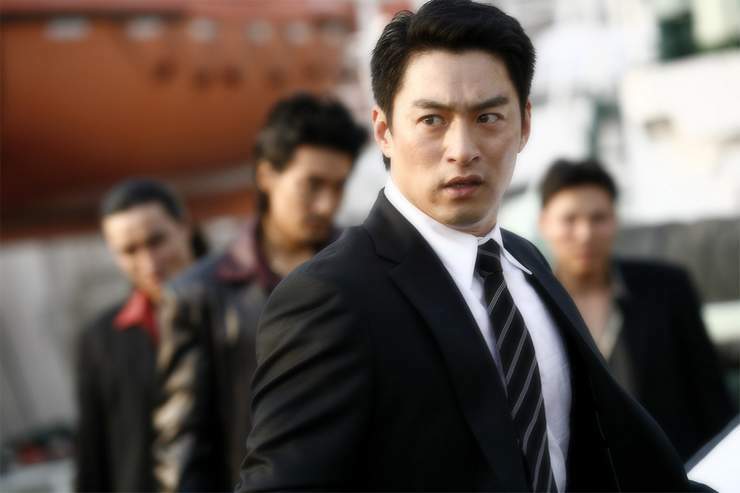 Kwak Kyung-taek, widely known for his movie Chingoo (2001), directs and pens the romantic, and as excepted, filled with action and violence movie “A Love” aka “Love”. The opening scene of the film shows a young boy named Chae In-ho (Joo Jin-mo) with his mother in a car filled with their belongings, indicating their movement to a new home. The young boy is mesmerised by a young girl coming out of a church. The girl’s name is Jung Mi-ju (Park Si-yeon) and she attends the same school as Chae In-ho. After Chae In-ho helps Jung Mi-ju by stopping her teasing by their classmate named Nol-Bu (Lim Hyun-sung), who later becomes his best friend, she invites him to her birthday party, held at her home. Unfortunately, when he arrives at her home, he finds a hectic situation with people grasping every single item in the house and her mother just standing there smoking, and he leaves. The years pass without Chae In-ho and Jung Mi-ju meeting each other. Now in high-school, Chae In-ho is an athlete of Judo and after an incident with other high-schoolers, he meets and becomes friends with Jung Mi-ju’s older brother, without knowing his relation to Jung Mi-ju. In this manner, fate causes the two protagonists to meet again. After the death of Jung Mi-ju’s brother and mother, Chae In-ho makes the promise to take after her and, inevitably, the two of them come closer. One day, a gangster by the name Choi-kwon (Kim Min-jun) arrives and looks for Jung Mi-ju, since her brother and mother had borrowed some money. Once again, hardships appear in the path of the two protagonists. What will the future unfold for them? Will they manage to come over the struggles and be together at the end? The title of the movie “A Love” refers to the deep love between two individuals and answers the question of what means to love someone, unconditionally. It means to put this person above yourself and being self-sacrificing. Beyond this obvious type of love, the title also refers to the love between two close friends who are there for each other and support each other. Additionally, it indicates the parental love towards a child, even if the child is not blood related to the person. An underlying important message of the film is that sometimes, even if two persons truly love each other, the cannot stay together. Life is cruel and the circumstances do not let the two persons in love to have a common life. The movie has an interesting main character. 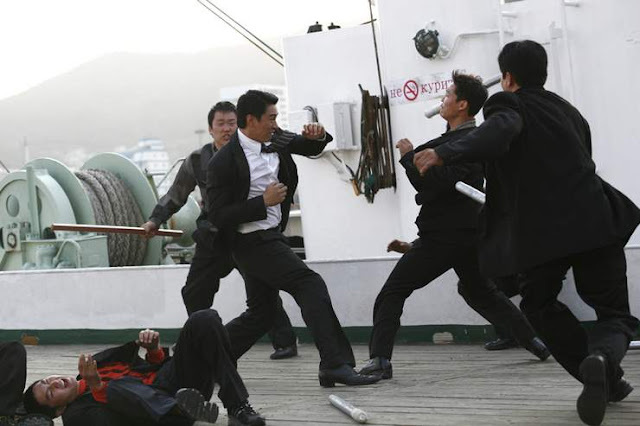 Chae In-ho loves to solve his problems with his fists instead of using conversation, and this leads him to unbearable consequences and suffering. Nevertheless, he always has noble intentions for his actions and this composes a very likable character, subsequently making the viewer root for him and his love. Another district trait of Chae In-ho’s character is the distinguished shyness in his conversations with people he barely knows, and in his conversations with Jung Mi-ju. This shyness is in a great antithesis with the rage he displays when someone hurts his loved-ones. Furthermore, Chae In-ho’s voice-over, during his fulfillment of his prison sentence, is an excellent method to provide a glimpse into Chae In-ho’s deeper thoughts and fears. The charismatic actor Ju Jin-Mo portrays the aforementioned symmetrically opposed emotions in an excellent fashion, merely with his body language. In addition to this, he demonstrates his deep love and angst with his appealing and expressive eyes. Moreover, the stunning actress-model Park Si-yeon is excellent in her role as Jung Mi-ju. She delivers a beautiful performance, full of emotions and for this role she won the award of Best New Actress at 27th Critics Choice Awards, which she truly deserves. Kwak Kyung-taek directs this film in a great manner and alongside the skillful editing of Park Kwang-il, elevates the value of the movie. Furthermore, the beautiful cinematography by Ki Se-hoo is another important asset of the film. The movie being a romantic-gangster movie poses copious questions. Among them, the utmost important is: How far someone can go in the name of love and what he/she is capable to do for it? “A Love” is a film that everyone can enjoy, either being fan of melodrama either fan of gangster genre movies, even though the final scene and the decision of the main character could be better.